For over 50 years Mitsubishi has remained at the forefront of the mini split industry thanks to their dedication to providing efficient' user-friendly comfort solutions. The MSZ-GL Series is a wall mounted heat pump mini split system. The functional design is paired with quiet operations that provide comfort without disrupting your space and installing a Mitsubishi wall mounted indoor unit is quick and easy thanks to their convenient mounting plate. With multiple operating modes' multiple fan speeds' and multiple airflow directions' this unit fits the needs of nearly any room. Advanced Filtration System combines a hybrid catechin deodorizing filter with an enzyme-based filter for managing allergens. The anti-allergy filter not only captures the offending particles' it also breaks them down' cleaning the air as it is conditioned. 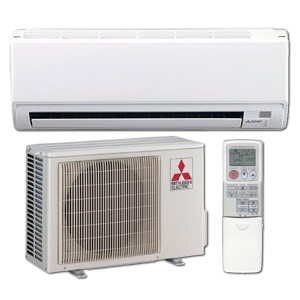 Hot Start Mitsubishis hot start technology prevents cold drafts by delaying fan operation until the heat exchanger has warmed up. Multiple Vane Control Options Auto mode selects the best vane position based on operating mode' and the swing modes cycle through all positions for maximum coverage. When wide mode is activated' fan speed increases beyond the current setting.